The flow of a fluid through a pipe of varying cross section can result in a variety of beautiful and useful phenomena. 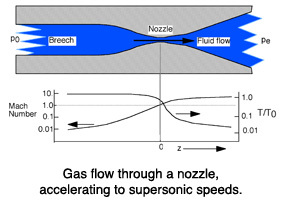 One important application is the rocket, highly accelerated flow of gas caused by its passage through a pipe that contracts and then expands, i.e., a nozzle. Magnetic nozzle research studies the properties of plasma — a complex and electrically conductive fluid — expanding though constrictions in space formed by magnetic fields or mechanical apertures. Applications of expanding plasma jets are in the fields of spacecraft propulsion, materials processing, and magnetic fusion research. Plasma jets are also of fundamental interest because of their importance in solar and stellar phenomena. 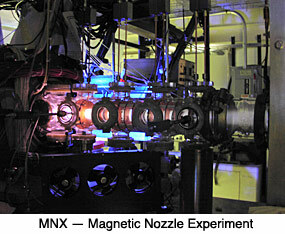 Magnetic nozzle research at the Princeton Plasma Physics Laboratory (PPPL) is conducted on the Magnetic Nozzle Experiment (MNX). The MNX utilizes a 30-cm-long helium or argon plasma column, initially three centimeters in diameter, confined by a magnetic field. The field is compressed at one location along the column — the magnetic nozzle. The plasma is squeezed as it passes through the nozzle and then expands as it flows out. During the expansion, the plasma cools and accelerates axially. Partial recombination into a neutral gas may occur. This phase transition is of fundamental interest to scientists who hope to use the magnetic nozzle to accelerate plasma to supersonic speeds for space propulsion. The recombination phenomenon is also of interest in the fields of fusion research, materials processing, and lasers. The U.S. Department of Energy’s (DOE) Office of Science (OS) funds magnetic nozzle research at the Princeton Plasma Physics Laboratory (PPPL) where experiments are performed on the MNX device. Both undergraduate and graduate students participate in MNX research. Collaborations with scientists from other institutions, especially with the Plasma Physics Group in the Physics Department at West Virginia University (WVU), have been extraordinarily productive. Magnetic nozzle research is also being performed by the Space Plasma, Power and Propulsion Group (SP3) at the Australian National University and at the Ad Astra Rocket Company. and is managed by Princeton University.